Names are starting to be released for the 2011 Taco Bell All-Star Legends & Celebrity Softball Game. Participants announced earlier in the week include Jason Aldean, Nick Jonas, Jordin Sparks, Chord Overstreet, Tim DeKay, Jesse Williams, Paul Dimeo, Tom Papa, Larry Fitzgerald and Jennie Finch. Past MLB stars also are scheduled to participate, including former Diamondbacks players Luis Gonzalez and Mark Grace; former MLB All-Stars Fred Lynn, Mike Piazza, Steve Garvey and Bernie Williams and Hall of Famers Ernie Banks, Rollie Fingers, Rickey Henderson and Ozzie Smith. FS Midwest has an article up on how DK57's presence is still a major part of the Cardinals. Nine years have passed since Darryl Kile was taken too soon, and the legacy of the former St. Louis Cardinals pitcher still makes Albert Pujols grin. A Pujols favorite involves one of the slugger's first appearances at spring training with the Cardinals. At the time, Pujols' promise had yet to mature and making the big club was his goal. Yet, Kile saw something burn bright in the young player. He dared Pujols to dream. "Don't be afraid to make the All-Star Game," Pujols recalls Kile telling him. 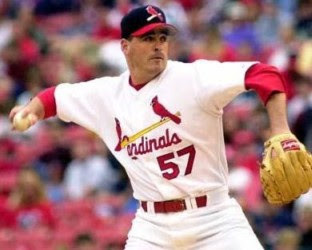 "When you're a big-league player, you can start to think you are the most important person on the planet if a fair number of people tell you that every day," said Rick Horton, a former St. Louis pitcher who served as the Cardinals' chaplain in 2002. "You can tend to get a little too wrapped up in that, but he had a great humility in terms of how he was with his relationships with people around the club." That humility was evident. In his time with St. Louis, Kile mentored Matt Morris and Rick Ankiel, and Pujols credits Kile as one of his inspirations to make a mark with relationships in the clubhouse. "Team player" is an overused term in sports. To La Russa, "DK" was something more. He was St. Louis' soul. "In the end, this game is never going to be there forever for you," Pujols said. "Some time, you're going to be done and walk away. You have to think about the things off the field and the relationships you build and take it with you. Those are the only memories you can take." 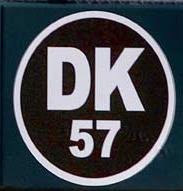 I get chills just thinking about DK57's loss. All you have to do is take a look towards the bullpen during games. It's been nine years since one of the darkest weeks of Cardinal history. 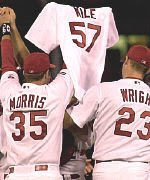 Darryl Kile (December 2, 1968 – June 22, 2002)) played his last game on June 18, 2002, the same day that Jack Buck died. Darryl tragically died nine years ago today in Chicago. The following was posted on CardNilly.com a few years ago. It's so awesome yet sad at the same time. I always get chills whenever I think of DK and his short time on earth. This has been sitting in my email for a few days but it's worth posting. Lee Smith ought to be inducted into the Hall of Fame. Until his record was broken by Trevor Hoffman and Mariano Rivera, Lee Smith held the record for most saves. As such, if the Hall of Fame writers allow players like Bruce Sutter and Goose Gossage in the Hall, they ought to make room for Lee Smith, too. Many baseball observers believe Lee Smith belongs in the Hall of Fame. Smith hopes that belief someday translates into his own plaque in the Cooperstown, N.Y., shrine. "I surely hope we get that," said Smith, who threw out the first pitch and signed autographs at the Corn Crib Saturday. "It was good to see Bert Blyleven (elected). I hope he gets out of the way and helps me get some of the votes. "But to actually be thought of in the same breath with some of those guys, Fergie Jenkins and a good friend of mine Harmon Killebrew, is really a good feeling." Currently working as a roving pitching instructor in the San Francisco Giants farm system, Smith said he enjoyed his time in Chicago and St. Louis but has to root for the Cubs when the heated rivals meet. "I've got a couple guys on that coaching staff who are my buddies, Bobby Dernier and Ivan DeJesus," said Smith. "But in my heart, I've always been a Cardinal fan. I love the city and who wouldn't want to pitch in St. Louis in that era? "You've got the big ballpark and Ozzie Smith and Willie McGee behind you. And the city itself is baseball knowledgeable. I have a lot of love for both of those cities." Similarly, Marvin Miller should be in the Hall of Fame as well. The only reason I thought of his importance is that I watched Jews and Baseball: An American Love Story earlier this evening. Take out his leadership of the Players' Association and free agency would be a completely different animal altogether in this day and age. Sandy Koufax, before retiring, threw his support behind Miller.